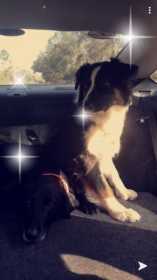 Zoie is a black tri Australian Shepherd and is missed very much. I know she’s loved by someone and they have no clue the dog was stolen. I miss her very much.